WINSLOW BATTLES, son of Jonathan and Mariah (Dickerman) Battles, was born Sept. 30, 1818; taught some 18 years at Stoughton, Dorchester and Boston, (Mayhew School). He was distinguished for his interest in vocal music as connected with public worship; was a member of the Randolph. Choral Society and President of the Old Stoughton Musical Society, 1873-1888; Chairman of School Board and Massachusetts State Senator for two terms; an advocate of prohibition legislation and a power in politics. He was a ready debater, a pleasing speaker and a graceful presiding officer. His Christian graces shone in his character and he was beloved and honored by a host of friends. He died Feb. 26, 1889, at Randolph. JESSE BILLINGS, lived in Sharon and was the father of Sanford Billings, who died in 1885, and grandfather of Sanford Waters Billings. Jonathan Billings was his brother and lived and died on the same farm. SANFORD WATERS BILLINGS, Few men have been called upon to fill more responsible positions, or were more deeply missed in their home community than the late Town Treasurer, Sanford Waters Billings, of Sharon, who died on Monday, Dec. 30, 1901, of pneumonia, after an illness of but one week. On Sunday, Dec. 22, he was in his accustomed place in the Congregational Church and Sunday School, in which he was ever faithful, active, and inspiring in his zeal. On Sunday afternoon, he attended the mission service in the North and West school, in which he had taken the leadership so many years, and it was while returning that he was stricken with the fatal chill. Praised be his spirit, steadfast to the last. Shirking no burdens, but cheerfully doing his duty as he saw it, of whom can we more truly say, "Well done, thou good and faithful one." Mr. Billings was born Oct. 3, 1834, his parents being Sanford and Caroline Waters Billings. He received his early education in the Sharon public schools, afterwards entering Amherst College, from which he was graduated in 1857. At the close of his college course he became a teacher, which profession he followed for 30 years, his first work being in the East school. In '61, Mr. Billings established the Stoughtonham Institute, a preparatory school, in Sharon, of which he was the principal all but two of the 17 years of its existence. Many well-known names are mentioned as graduates of this school, the reunions of which were marked by genuine fellowship and loyalty. In 1878 the town decided to establish a High School, and upon the recommendation of the School Committee, Mr. Billings was engaged as Principal, which position he held until 1891, when he resigned to become Superintendent of the schools of Harwich and Provincetown, filling the position with credit for two years. As a private tutor he had also been very successful. On the School Committee he served continuously from 1862 to 1880, and again from 1883 to 1887. Mr. Billings had long been active in town affairs. The high appreciation of his townsmen was such that from April 6, 1863, to October 24, 1901, he was elected presiding officer at 84 town meetings. As Moderator his judgment was generally prompt and parliamentary, and in this position more than all others, perhaps, will the loss of his kindly presence be felt. He served as trustee of the Public Library from 1888 and as Town Treasurer the past seven years. In 1873 and 1874, he represented the district of which this town was then a part, in the lower branch of the State Legislature. While there he was actively interested in securing the passage of an act providing for free text books in the public schools. He was also prominently mentioned in the past as candidate for the State Senate. Mr. Billings was from early manhood a leading figure in the religious life of the town, for 35 years a member, and during several years past a Deacon of the Congregational Church. He was also Superintendent of the Sunday School, and a leading spirit in the meetings of the Christian Endeavor Society. He was a strong temperance advocate, a member of the Massapoag Lodge, I. 0. G. T., since its organization and for many years President of the Norfolk County Temperance Union. He was an active member of the Old Stoughton Musical Society and held the office of President when that organization gave its notable concert at the World's Fair in Chicago. His love of the old time music was ardent and inspiring and he was ever willing to lend his voice in funeral or thanksgiving. At a recent sing of the Society in Sharon his absence was regretfully remarked. Mr. Billings was widely known and respected in this section. He was the personification of the old village squire, with his many and varied duties as Justice of the Peace, writer of wills and other legal documents, called frequently as adviser, appraiser or administrator, and to preside at many a funeral rite. In all respects he was in intimate touch with the life of the most distant resident, with a friendly greeting for all, young and old. Mr. Billings love of family associations and New England genealogy was shown in his work as Secretary of the Billings family Association, and in his great interest in its reunions. In his connection with journalism, as local correspondent of the Dedham Transcript for almost a generation, and recently as editor of the Sharon News, and as valued contributor to other papers, Mr. Billings was well-known all through the county. He also acted as agent for this vicinity of the Norfolk Mutual Fire Insurance Company for many years. He was survived by a wife, a son, Osmond J. Billings, a student in the Yale Divinity School, a daughter, Miss Abbie C. Billings, three sisters, Mrs. Silas A. Stone, Mrs. Josiah W. Perry and Miss Harriet C. Billings of Sharon. ANDREW CAPEN, lived near where the poor house in Canton now stands. The late Nahum Capen was his son. JONATHAN CAPEN, lived on Pine Street, Stoughton. SAMUEL CAPEN, the first Secretary, was born in Dorchester in 1727; married in Canton and lived on Pleasant Street. He was a hatter by trade. He died in Canton, Dec. 7, 1809. Among his descendants was Mr. Edwin Wentworth of Canton, the son of Mr. Nathaniel Wentworth, whose wife was the daughter of Samuel Capen. Mr. Wentworth inherited all his grandfather's love for music and was a leading business man and the largest landed proprietor of Canton. THOMAS CAPEN, lived in Stoughton, north of the village. FRIEND CRANE, lived at Canton Corner, opposite the old Town House, and had a store in the building occupied by the Canton Knitted Carpet Lining Co., which he sold to Leonard Everett and removed to South Canton, where he died about 1850. He had one daughter, Julia Crane, the wife of Mr. Edwin Wentworth, just mentioned, who was among the early female singers in this Society. Friend Crane was a magnificent bass singer and it was with delight that they listened to his singing in the choir of the Baptist Church of Canton, of which he was a member up to the time of his death. PETER CRANE, lived opposite the site of the present Baptist Church in Canton Village; was a blacksmith and made scythes by hand with his brother. One of his daughters married Timothy Fuller, a lawyer of note and the father of the noted Margaret Fuller. DR. T. HAVEN DEARING, was born in Kittery, Maine, son of Capt. Roger Dearing and his wife, Lucinda (Boston) Dearing, both of Maine. His father was of English descent and for many years a sea captain, afterwards carrying on commercial pursuits at Kittery and at Portsmouth. Dr. Dearing received his early education in the common schools of Kittery, in different New England academies and continued it under special tutors and in special college courses. He began the study of medicine and subsequently studied at the best colleges of New York, Philadelphia and Boston, and visited the principal hospitals of Europe. He was assistant surgeon of Boston Regiment, A. S., U. S. A., in the Civil war. He first settled in Boston, was professor of surgery and dermatology in the College of Physicians and Surgeons, and for nearly six years was dean of the college. From May, 1863, up to the time of his death, Dr. Dearing was a resident physician of Braintree. He was President of the South Norfolk Medical Society, a member of the Massachusetts Medical Society, the American Medical Association, ex-Vice President of the Massachusetts Medical Society, and member of the Harvard Medical Alumni Association. In 1889, he was elected Representative to the House. He married Mary J. Jenkins, daughter of the late Deacon Solon Jenkins, of Boston. Dr. Dearing was a member of the First Congregational Church, Union Musical Choral Society of Braintree, and its President for three years, the Stoughton Musical Society as its President, the Masonic Order and the Knights of Honor, a member of the Boston and Braintree Pine Tree Clubs, and President of the latter. He died October 15, 1908. ELIJAH DUNBAR, was the son of Rev. Samuel Dunbar and lived in the old manse. He led the singing in the old church; was a Justice of the Peace, and during the War of the Revolution was Town Treasurer. In 1782, he was one of the Committee of Safety and Correspondence and was chosen Senator in 1789. He was born on the 2nd of Sept., 1740; he lived with his father, entered Harvard College in 1756 and graduated in the class of 1760. When the First Parish in Stoughton petitioned to be made a Town, (in 1795), Elijah Dunbar was chosen Chairman of the Committee to prepare the petition and the Parish voted that Mr. Dunbar name the Town, and he presented the name of Canton; and on the 23rd of February, 1797, the Town of Canton was incorporated. The last office which he held in Canton was the keeper of the "Powder House," which until lately stood on the land belonging to the estate of the late James J. Sumner. It is said that he led the singing at Harvard College in Commencement days until his death in 1814, after which the Rev. John Pierce, of Brookline, of the class of 1793, took his place. His father died in 1783, and was a minister for 56 years, during which he kept one of the most remarkable records of a church ever known. Of this record of his father and of his predecessor, Rev. Joseph Morse, Elijah Dunbar made a perfect copy, which is now in possession of the minister of the First Congregational Church in Canton. At his father's death, he became the owner of the house in which his father lived and the farm where he was born. The old house in which he lived went out of the family name many years ago and stood on what is now Chapman Street and on the spot on which it stood until a few years ago. An elegant, large, stately house of the Queen Ann style of architecture has been built by Mr. Thomas Draper. He was a man of good presence, the worthy son of his Alma Mater, learned in the art of singing and a zealous Christian, observant of all the ordinances of the church; a good singer and good conductor of singing. The table around which the singers sat in the old Meeting House stood in front of the pulpit. In 1784, there was a Jubilee over the Peace and the singers of the three Parishes of the former township of Stoughton, now Canton, Sharon and Stoughton, were present, and there was a contest for the leadership between Col. Robert Swan and Elijah Dunbar, and Dunbar was elected, appearing to be the better singer. He died Oct. 24, 1814, in Canton. He was very rich in lands which came to him through his mother, who was the daughter of Rev. Samuel Danforth of Dorchester, he being at one time the owner of Charlton and Oxford townships in the present County of Worcester, as well as much land in Dorchester and Stoughton; and he left numerous descendants and a good name, which is better than riches. JOHN D. DUNBAR, was the son of Elijah Dunbar; graduated at Harvard College in 1789, and it is thought he became an eminent lawyer in Plymouth, where he died in 1809. THOMAS DUNBAR, was the son of Elijah Dunbar, and at the time of his death in 1855 was Deacon of the First Congregational Church in Canton; of the choir he had been leader for many years and was succeeded by Nathan Packard, a former member of this Society, who, on removing to Brockton, was succeeded by Samuel B. Noyes, who was the Chairman of the Committee on Music in the Society and member of the choir, of which choir Thomas Dunbar, son of the late Thomas Dunbar, at the age of 73, was an active member and of which James Dunbar, son of James Dunbar and great-grandson of Elijah Dunbar, at the age of 30, was a member of the tenor, and Mr. George F. Sumner and Charles N. Draper were also members of the Committee on Music. DR. CHARLES C. FARNHAM, Past President of the Old Stoughton Musical Society and for many years its Secretary and one of its most interested members and supporters, was born in Clinton, Conn., Nov. 6, 1858, and passed most of his life in Randolph, where he practiced medicine for many years. At the time of his death, he was Dean of the Norfolk County medical profession. He was a graduate of the University of New York and later took an advanced course in medicine at Yale University. For a few years after his graduation, he practiced in Connecticut, afterwards going to Randolph in 1874, and until his passing away on March 8, 1925, was one of the best known and highly respected and beloved citizens of that town. He married Annie Tolman Howard, a "sweet singer in Israel," one always interested in music, and whose voice and talents, in a musical line, were always at the command of the Old Society as a valued soloist and member. Dr. Farnham held many local offices of trust and responsibility in Randolph, serving as Town Clerk, Treasurer, and as Treasurer of the Randolph National Bank, and was a leading member of the Baptist Church. His greatest delight in life was in music and its attainment. As a member of the Old Society, he was always ready and willing to answer all calls for service and helpfulness, and the Society owes much to his untiring efforts and zeal for all the concerns of the years during which he was one of its most influential members. For years, he served as Librarian of the Turner Town Library and his interest in literature and education was a community asset. Dr. Farnham was particularly interested and helpful in the the Chicago Pilgrimage of the Old Society and aided most substantially in promoting the success of that outstanding event in the Society's history. THOMAS FRENCH, son of Thomas and Salome (Babcock) French, of Dedham, was born February 1, 1778. He married Miss Abigail Shepard Tucker, of Canton, February 21, 1811, and lived in the second house northwest of the Ponkapoag Hotel. He served the town in many capacities; Town Clerk, 1815 and 1819 and School Committee, 1823-1826-1835-1842. As Commissioner of the Indians in 1827, Mr. French signed the deed for the last piece of land of the Ponkapoag Plantation. He was President of the Day at the celebration of the semicentennial of Independence and presided at the sixty-third anniversary of American Independence. He was a member of the First Parish, South Parish Lyceum, and the Literary Association. He was Justice of the Peace, President of the Neponset Savings Bank, 1835 to 1843. He became a member of the Stoughton Musical Society in 1818 and later its President. Mr. French died in Boston, March 11, 1862, at the age of 83 years, 11 months and 10 days. DANIEL H. HUXFORD, was born in Edgartown on February 28, 1853, son of Henry B. and Lavina A. Huxford. He entered the employ of the Vineyard Gazette in his youth, and a few years after was employed on the New Bedford Standard. In '69, he went to Rockland, where he stayed a few years and in 1872 he purchased from Charles M. Marchant the Randolph Transcript, which was afterwards finally changed to the Randolph Register and Holbrook News. He was fairly well known to all the people in this vicinity, and in Norfolk County, not only for being the editor and publisher of a newspaper many years but for his intense love of music. No man made his acquaintance but to love and respect him, and particularly should credit be given him for the conscientious, dignified, high moral tone of his editorial utterances. He did not run a newspaper in order to make the most money he could. From the dawn of his entry into the newspaper field until the final close, he was level-headed, honest and careful of his utterances. He was a Mason, Odd Fellow, Past President of the Old Stoughton Musical Society, and always present at its meetings. He belonged to a few other local societies. He was a member of the Massachusetts and Suburban Press Association about 20 years. He was one of the most even-tempered men, a tender, kind and true friend. Going to the Homeopathic Hospital in Boston, in February, he remained there until about the first of May, when he was carried to his home in Edgartown to be with his mother. He lived only a few days after his return, the end coming May 4, 1905. EDWIN ARTHUR JONES, was born in Stoughton, June 28, 1853, and graduated from the High School at the age of fifteen and was prepared to enter Harvard College, but being misinformed as to the days of examination did not enter. His teacher, the principal of the Stoughton High School, thought it was perhaps for the best, for although he was well qualified in his studies he thought Edwin would receive more benefit from the college course if he waited until he was a few years older. He took a course of lessons on the violin and organ, and in harmony, at the New England Conservatory of Music and at the age of 19, after reviewing his studies, he entered Dartmouth College, whence he graduated on June 29, 1876. He was organist of the college chapel and the church during his four years at college, and President and Director of the Dartmouth Glee Club; was captain of the 76 baseball nine two years; editor, or one of the editors, of the "Aegis," Junior year; one of the speakers at the Junior examination; also at Commencement in 1876. Some part of the Senior year, he was President of the Athletic Association. He earned $200 while in college. During his course, he composed several pieces of music for the class and was leader of the Dartmouth Orchestra and played first violin in it. He was President of the class the first term of Junior year, and one of the editors of "The Dartmouth" during his Senior year. As busy as he must have been with his music and athletics, he did not neglect his studies and graduated with an honor. He joined his family in Baltimore after leaving college and read law for a short time, but was obliged to drop it when the busy season opened and everything was to be made ready for the fall trade and for the holidays in the "Dollar Store" in which business his father and brother Henry were engaged. He made the acquaintance of Mr. Asger Hamerik, of the "Peabody Conservatory of Music," and a very pleasing friendship was the result. While in Baltimore, he composed his "Nativity Hymn," which he entered in competition for a prize of $1,000, at the Cincinnati College of Music, Theodore Thomas being one of the judges. He was one of four that received honorable mention by the judges. He was offered a position in Mr. Hamerik's orchestra if he could remain in Baltimore, but concluded to return to Stoughton with his parents. Soon after settling in Stoughton, he was engaged as organist and choir director at the Congregational Church; he also took pupils for instruction on the violin and piano, and lessons in harmony. He organized an orchestra, which became very popular among the music lovers in and about Stoughton. He became a member of the Stoughton Musical Society in 1871 in order to take part in the "Peace Jubilee" of 1872, where he played the violin in that immense orchestra with Johann Strauss as leader. He was then only 19 years of age. He became a member of the Musical Society in Stoughton after his return from Baltimore in 1881 and took an active part in all its meetings (nearly 30 years) and concerts, and composed an "Easter Anthem" for the Society to perform on its 125th anniversary. He was a member of the "Cecilia Club" of Boston a few years and composed for them a part song entitled, "Up the Hillside,," which they sang with evident pleasure. He composed a "Prelude and Fugue," which was played by the "Kneisel Quartette" at Mrs. John L. Gardner's at a musical to which he was invited. He was chosen a member of the School Committee in 1890 by the Selectmen and members of the School Board, after the resignation of Mr. Henry C. Kimball, and elected at the ensuing Town Meeting in March, serving with earnestness and ability for twelve years in succession and a short term later, bringing the schools up to a high standard. He married Harriet Matilda Capen, daughter of Elijah G. and Sarah Azubah (Swan) Capen, June 20, 1894, and resided at the homestead where he was born. He purchased a house on Walnut Street in the late fall of 1901, which he altered and improved during the winter months. It was not ready to be occupied until the following spring. From the pen of one of his closest friends, ex-President L. W. Standish, we quote, "As a public citizen no call was ever made on him from his native town that went unheeded. He loved the old Town of Stoughton with a devotion that drew from him sacrifices of labor that few men have opportunity, the talent, or the ability to give. For fifteen years he served the town on the School Committee and left an impress on the schools of the town that has redounded to the benefit of the many who followed in the broad lines of educational progress which it was his privilege and ability to give. In the social affairs of the town, he was the prominent one to whom all turned when occasion called for service. He was President of the "Fortnightly Club," a Trustee of the Public Library; he was Secretary of the Chicataubut Club and served on various important committees of the town on special occasions. For years he was the leading spirit in our Society and served as President and Secretary, and at the annual meeting, Jan. 1, 1911, was elected Chorister for the ensuing year. "He was appointed by the Town a committee to design the Town Seal and gave that design to the Town. He was largely responsible for the movement which sent the Old Stoughton Musical Society to the World's Columbia Exposition at Chicago in 1893. He Was interested in historical matters and was an active working member of the Stoughton Historical Society and its President. He was one of the organizers and most enthusiastic friend of the Old Home Week Celebration and Manufacturers' Exposition and gave his time, his money and his efforts for countless local enterprises and town movements. He was untiring and unsparing in his efforts for his beloved town and the records of his helpfulness would cover a multitude of details. At his death, which occurred Jan. 9, 1911, the town was bequeathed the residue of his estate, which in later years amounted to $70,000, towards the establishment or maintenance of a public hospital. Our Society is the recipient of $100.00 yearly by his will "for the maintenance of the annual concerts." Clause "C" of the will, dated June 22, 1908:- "One hundred dollars in gold, or its equivalent, shall be given annually to the 'Old Stoughton Musical' Society' (organized Nov. 7, 1786) for the maintenance of the annual concerts of the said Society." MARY MATILDA (SWAN) JONES, youngest child of James and Betsy (Capen) Swan, married Henry Jones Oct. 25, 1846. She was born Oct. 19, 1827. She taught school previous to her marriage, a private school in the old Drake schoolhouse at the age of fourteen years with thirty scholars, and began teaching in the public schools at the age of sixteen. There were then but two schools in the district. She taught a winter term after her marriage at the request of the Prudential Committee. The whole number of scholars for the winter term was 65; the summer previous it was 76. There were then three schools. The report of the School Committee was always very favorable to her work. For the summer term, the report said, "This school, as might be expected from the well-known character of the teacher, was thoroughly taught, etc." For the winter term, it said, "Too much cannot be said in praise of this school. The Prudential Committee were very fortunate in securing the labor of one who had been for several terms so successful in this department as a teacher, etc." To retain her services, the Grammar School was offered to her but was refused. Interests of Stoughton" in minute detail, beginning at the Dorchester Settlement. Of exceptional interest are the brief histories of the two musical societies which were organized in Stoughton. 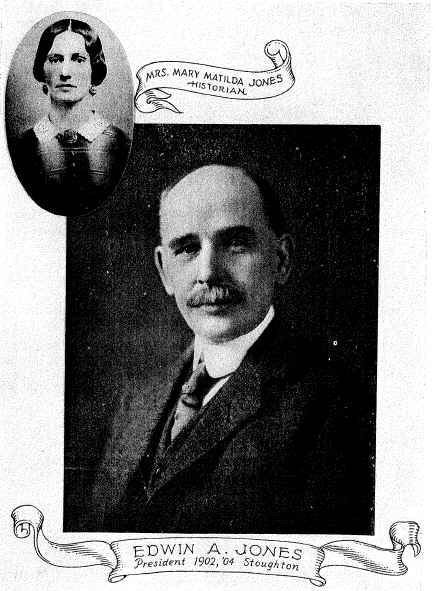 Mrs. Jones died June 3, 1902. JOHN KENNEY, Jr., owned what was later known as "Cherry Tavern.'' This house was built in 1753, and John planted the cherry trees. John was born in 1729 and died in 1805. He was one of the five to go to Dedham on the "Suffolk Resolves." ENOCH LEONARD, had a factory near Sharon and was engaged with his brother making swords in 1815. ISAAC MORTON, probably lived somewhere near where Nathaniel Sumner White lived in Canton. SAMUEL BRADLEY NOYES, eldest son of Samuel and Elizabeth (Morrill) Noyes, was born in Dedham, April 9, 1817. On his father's side he was of the Noyes' family of Choulderton, Wiltshire, England, and his ancestor, Nicholas Noyes, with his brother James, a clergyman, came to New England in 1634; to Newbury in 1635, five years after Winthrop's settlement of Boston. On his mother's side his grandfather, Eliakim Morrill, was a highly respected citizen of Dedham, and his great-grandfather, the Rev. Isaac Morrill, (Harvard University, 1737), was a solemn Puritan divine, who died in office as pastor at Wilmington in 1793. It will thus be perceived that Mr. Noyes was of a very old New England stock, and of that Puritan clerical strain which 'Dr. Holmes so felicitously called "the Brahmin caste" in society. Mr. Noyes had always been interested in church and parochial affairs and had enjoyed a wide acquaintance with the clergy of his faith. He attended the public schools, and for one year a private school in Dedham, under the tuition of Hon. Francis W. Bird. He entered Phillips Academy, Andover, in 1836, and remained till the summer of 1840, when he left to join his class at Cambridge, (Harvard University, 1844). On leaving college, he studied law with the Hon. Isaac Davis, of Worcester; afterwards with Hon. Ezra Wilkinson, of Dedham, and Hon. Ellis Ames, of Canton. He was admitted to the Norfolk County Bar April, 1847, and began practice in his adopted town of Canton, where he resided, except two years spent in Florida, until his death. He married, in January, 1850, Miss Georgiana, daughter of James and Abigail (Gookin) Beaumont. Her father came to New England from Derby, England, in 1800, and built the first mill erected for the manufacture of cotton by machinery in Massachusetts in 1802. Her. mother was the daughter of Edmund Gookin, a lineal descendant from Daniel Gookin, who, in 1650, was Magistrate of all the Indians in Massachusetts, and who accompanied the Apostle, John Eliot in his visits to the various tribes, and whose history of the Indians is published in the collections of the Massachusetts Historical Society. 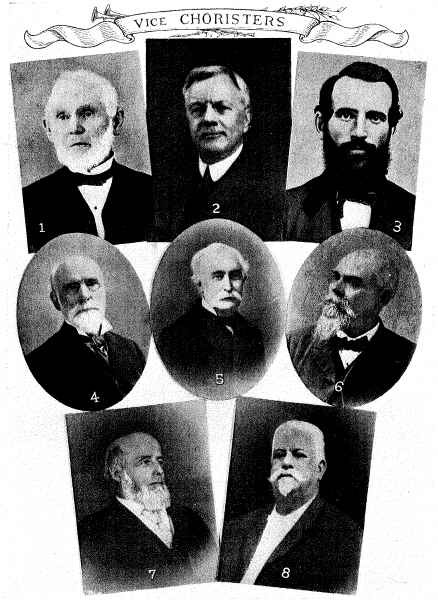 Mr. Noyes' public offices were numerous. As a lawyer, Mr. Noyes was naturally interested in politics, State and National, giving much time and attention to question of public policy and administration. In private life, Mr. Noyes was known as a man of taste and culture, a reliable friend, and never more so than when friendship was needed; a genial companion and an accomplished entertainer in private hospitalities. The classics in his school and college life were to him life-long companions and friends. He was from his youth devoted to music with an absorbing interest. While in college he was leader of the college choir and the Harvard Glee Club. He was also a very industrious writer for the public press, and his historical and local essays were of a picturesqueness and vivacity which were charming. The last years of his life were spent in retirement from business, which, owing to his blindness, he was no longer able to conduct, but he still kept up an interest in the activities of his day and wrote frequently for the press, which had been his habit through life. Mr. Noyes died on January 12, 1900, aged 82 years and 9 months. L. MORTON PACKARD, was born in North Bridgewater, (now Brockton), Dec. 25, 1851, the son of Lucius H. Packard and Emeline W. (Snell) Packard. He attended school in North Bridgewater until the age of 15, when his parents moved to North Stoughton. He entered the Stoughton High School when 15 years old. from which he graduated. After finishing school, he entered his father's shoe manufacturing business, learning the trade from beginning to end. At the age of 20, he became interested in music and took up the study of voice at the New England Conservatory of Music in Boston, later studying with Dr. Horace R. Streeter and Signor Vincenzo Cirillo. He appeared in concerts in nearly every city in New England and sang in many churches. He returned to Brockton later, where he was tenor soloist at the First Congregational Church and the First Universalist Church. He participated in the operatic offerings of the Murray Dramatic Club, in whose musical productions he assumed tenor roles. He became a member of the Old Stoughton Musical Society in 1874, of which he served as President at one time. He married Ellen Frances Thayer of Randolph, who also was a member of the Old Stoughton Musical Society. After his retirement from the active musical world, he still held a deep interest in music. After an illness of about four years, he died Jan. 27, 1921. CHARLES F. PORTER, was born in Randolph, Mass., Jan. 16th, 1836. At an early age, he became a clerk and worked in dry goods stores in that vicinity and Maine. When 21 years of age, he opened a market in N. Bridgewater, (now Brockton). Finding this unsuccessful, he entered the shoe business with F. W. Packard, under the name of Porter & Packard. This firm dissolved in 1874 and Mr. Porter continued alone until 1886, when labor troubles caused him to close out. He then purchased coal yards on Montello Street and built a profitable business until his death. He served as Alderman; also in the House of Representatives; was also a Mason and belonged to several other orders. He was married in 1854 to Myra F. Niles, at Braintree, Mass. His death came on March 26th, 1903, as the result of an automobile accident. MARCUS MORTON PORTER, of No. Easton, veteran of the Civil war, was born May 12, 1841, in Stoughton, son of Robert and Eunice (Freeman) Porter; was educated in the public schools and made his home in Stoughton for nearly 50 years. On Sept. 15, 1863, he enlisted in the 47th Mass. Infantry, but his company disbanded a little later and Mr. Porter enlisted in the Old Concord Artillery, which joined the Mass. Infantry at Boxford. Mr. Porter did valiant service for his country and received an honorable discharge. He was a member of St. John Chambre Post 72, G. A. R.; Easton Grange, P. of H., and the Unionville Improvement Society of Easton; also a member of the First Baptist Church of Easton. 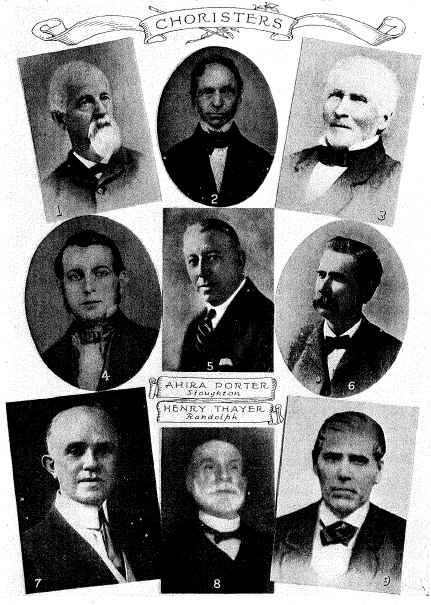 Mr. Porter joined the Old Stoughton Musical Society in 1893 and became President in 1911-1913. He was a fine bass singer and was always in attendance at the gatherings of the Society. His death occurred Sept. 25, 1921. JOSEPH RICHARDS, lived in Sharon near the Dry Pond neighborhood. JOSEPH SMITH 4th, kept a tavern on the spot where the present poor house in Canton stands and there probably the meetings were held. GEORGE N. SPEAR, was born in East Randolph, (now Holbrook), in 1829, and died April 5, 1894. He received his education in the common schools and then entered the boot and shoe business. In 1865, he built the first steam shoe factory in Randolph and later was superintendent of a large shoe factory in Boston. In 1868, he was in the carpet business in Chicago; was burned out in the fire of 1871 and returned to Boston, where he entered the oil business as Treasurer of Underlay Oil Co. He was also President of the Gurney Heater Co. He was chairman of the committee that built the Winthrop Congregational Church in Holbrook, in 1879, and was always a leader in its musical affairs until his death. He sang in the "Peace Jubilee," in 1872. He joined the Society in 1854. LEMUEL W. STANDISH, Past President of the Old Stoughton Musical Society, a lineal descendant of Captain Myles Standish of Plymouth; was born in North Easton and was for 30 years Editor and Publisher of the Stoughton, Mass., Sentinel, afterwards removing to Stoneham, Mass., where he continued his literary work as Editor of the Boston Masonic Club Bulletin and of the Eastern Star World, and writer and contributor to magazines and other publications. For years he was closely allied to musical matters in his home town of Stoughton and sang for over 12 years in the Congregational church quartet. He joined the Old Society in 1883 and was elected President m 1914-'16. He was a member of the Committee in charge of the 100th Anniversary Celebration and also of the Chicago Pilgrimage of 1893. He has served for the past six years as a member of the Great and General Court of Massachusetts from the 22nd Middlesex District and was re-elected for his fourth term at the election recently. Besides his literary work, his greatest interest has been in musical matters and association with the Old Society and all of its doings. Mr. Standish always gave unstintingly space in his paper for the advancement and praise of the Old Society, and now has rendered valuable service in this publication. JAMES TRIMBLE STEVENS, son of Benjamin and Elizabeth A. Stevens, was born in Braintree, Norfolk County, June 20, 1835. His education was gained from the district schools of Braintree and the Hollis Institute, an academy of high standing at that time. He began life as a practical workman with the firm of Randall & Co., tack manufacturers. He continued steadily at this employment for 10 years, when the Civil war turned aside for a time the current of his life. He went to the front as 1st Lieutenant, Company C, 4th Regiment, Massachusetts Militia. The company having served out its term he returned to Braintree and again left for the seat of war, Captain of Company I, 42d Regiment, Massachusetts Volunteers. At the close of the war, he renewed his connections with the tack business as an employee, and Jan. 1868, associated himself with G. D. Willis, forming the firm of Stevens & Willis, tack manufacturers. Mr. Stevens was married Dec. 12, 1860, to Myra F. Willis. Of this union are two children, Idella F. and George W. Stevens. Mr. Stevens was a Representative to the General Court, 1876, from Braintree, and Senator from the 1st Norfolk District, 1888-1889. He was the first Commander of Post 87, G. A. R., of Braintree; first President of the Braintree Co-operative Bank and served for 33 years. Mr. Stevens was always interested in music, having joined the Old Stoughton Society in 1854. He was President of two organizations in his native town and President of the, Stoughton Musical Society in 1905. He was President of the Braintree Musical Society, which contributed its share to the great success attending the wonderful "Peace Jubilee," held in Boston in 1872. Mr. Stevens died March 16, 1923, in his 88th year. ELISHA WALES THAYER, was born in East Randolph, (now Holbrook), Aug. 8, 1812. He was named for a fifer of the Revolution. The family home stood on the corner now occupied by the first Congregational church. As a young man, he engaged in the shoe business, employing a few of his neighbors. Mr. Thayer took more than an ordinary interest in community and town affairs and served often in town and church affairs, serving as one of the first Board of Selectmen in the new Town of Holbrook in 1872. He was eager to further any scheme to improve roads, schools, library, lecture courses and music. A man who stood for progress and helped to that end. He joined the Society in 1862 and died in 1891. SAMUEL TOLMAN, was the son of Thomas Tolman of Stoughton, and a brother of Thomas Tolman, who practiced law in Canton In 1835. DR. EUGENE S. TRACY, was born in Enosburg, Franklin County, Vermont, on Aug. 13th, 1861. He came to Stoughton in 1887, where he practiced his profession, dentistry, for several years. Later he moved to Brockton, where he is still engaged in practice. Dr. and Mrs. Tracy joined the Society from Stoughton in the year 1886 and both have been ardent and faithful members. Dr. Tracy was elected President of the Society in 1922 and served until 1927. ATHERTON WALES, lived in Stoughton and was a grandfather of a distinguished citizen of this town, Hon. Nathaniel Wales. PROF. HIRAM WILDE, an old resident and native of Randolph, died in 1910 at his home, 85 Wal deck Street, Dorchester, at the age of 82. He was born in Randolph Sept. 22, 1828, being a son of Mr. and Mrs. Harrison Wilde, and was educated in the public schools, having the honor of being one of the first pupils to enter the Stetson High School at its opening in 1840. Prof. Wilde was always interested in music, and began teaching it when but eighteen years of age and continued until within a few years, with the exception of the time spent in the army. He was appointed supervisor of music of the Boston public schools in 1866, filling the position for 14 years, and was urged to continue, but owing to a slight defect in hearing was obliged to decline. He was an active member of the Handel and Haydn Society for thirty years. He was a member of the Old Stoughton Musical Society, joining in 1852; was elected Chorister and served in that office 25 years. He was a veteran of the Civil war, enlisting at the first call for troops in 1861, as Second Lieutenant in the Second New York Infantry, serving two years; re-enlisted in the same Regiment at Syracuse, N. Y., in 1863, as Captain of Company A, serving until the close of the war. He was in Sherman's march to the sea and retired as Major. He held four commissions, two from Gov. Morgan and two from Gov. Seymour. At the close of the war, Major Wilde returned to Boston and resumed his musical work, and many of the notable vocalists of Boston and vicinity attribute their success to the instruction received from him.